Barton Glass is the simplest, most affordable and dependable management console for Storage Spaces Direct. Above all, we’re aiming to redefine the concept of simplicity in the development of Barton Glass. 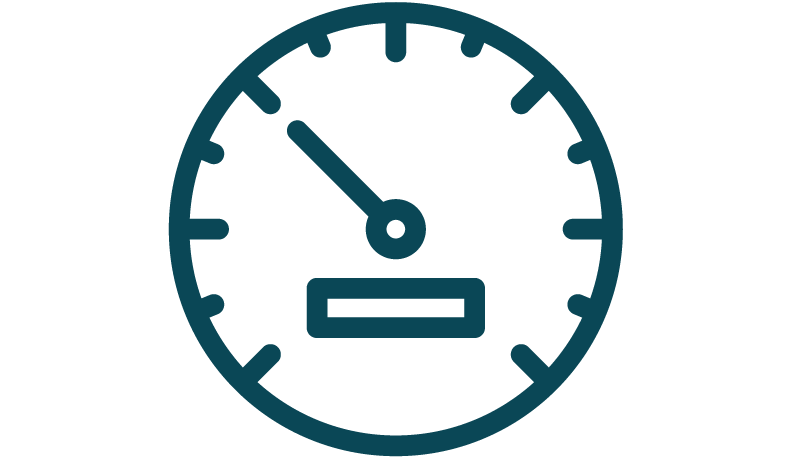 Our developers have made storage management as simple as a three-click provisioning, and our zero-touch deployment solution ensures the entire storage cluster is operational in a matter of hours. Barton Glass handles all your storage capacity needs with your Storage Spaces systems with ease. Managing storage becomes amazingly simple and everything happens without any intervention from your IT staff. The smart software keeps a close eye on the health of your Storage Spaces and its auto-remediate capability means everything runs smoothly. If there is an issue, Barton Glass will automatically alert Barton Systems support services and they will take immediate action. The Barton Glass dashboards come with clear and attractive displays so that you can see the operational status at a glance. 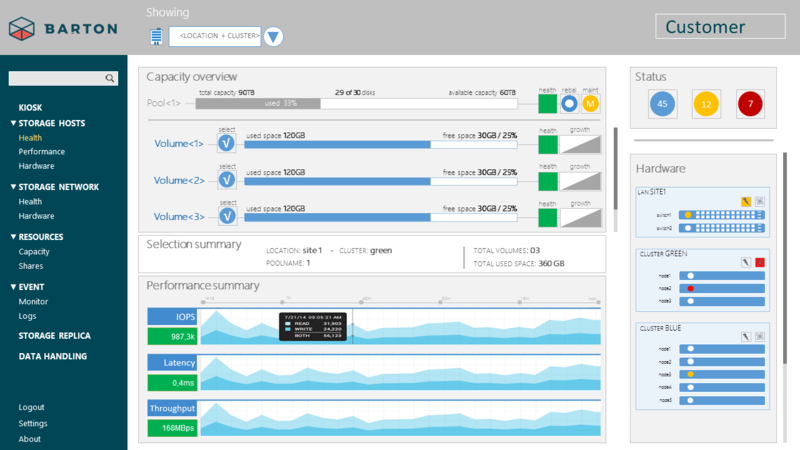 Some dashboards show information about the support status for the operations team, while others display data on features such as performance, load, capacity, and network and server hardware. The comprehensive dashboard always keeps you in the picture. With Barton Glass, provisioning storage is as simple as creating a share and indicating whether you want that share to be continuously available (resilience) or highly available (performance). What’s more, assigning a share doesn’t involve the hassle of working out exactly where you have the capacity you need, whether this is on a physical disk, a virtual disk, a RAID set or a LUN, be it thin provisioned or thick provisioned. Software-defined storage takes care of all this under the hood. We believe it’s important to keep you informed about the health of your storage server hardware and storage network, both of which are important building blocks of your Storage Spaces. Barton Glass delivers information on hardware status, hardware performance and generates alerts if needed. We support integration with Dell and HPE hardware and management software. We’re also working on integrating other hardware vendors, so that you have the broadest range of options available. The Barton Glass HTML5 console, running on a virtual machine, is hosted on our highly available storage cluster. The virtual machine with the Barton Glass operational environment runs fully isolated, which makes updating the management console easy and removes the risk of anything impacting the storage service. Storage management used to be a job for experts. Traditional storage is a collection of loosely coupled components, each with their individual configuration quirks. With new storage features added over the years, the complexity involved in day-to-day management increased even more. The lack of integration between the different components often made truly flexible storage very difficult. But software-defined storage such as Microsoft Storage Spaces is a game changer. Software now takes care of the integration too, which makes operating storage much more flexible and intuitive. On top of this, smart automation ensures that performance is optimized, data is continuously available and dependencies taken care of under the hood. If you want to manage Storage Spaces with remarkable ease, Barton Glass is your management console of choice. We use automated deployment to set up your Barton storage platform, which gives you a consistent and predictable result. Based on a few simple parameters, the deployment software executes the end-to-end deployment and the software configuration for your Managed Storage environment. Our software-defined approach to storage cuts through the complexity and costs of a traditional storage platform. Not only does a SAN platform require the constant services of specialized engineers, but it also depends on storage administrators who need to have the esoteric skills required to operate fabric, multipath, disk layout, RAID configuration, storage tiering and, trickiest of all, capacity provisioning. Barton’s software-defined approach simplifies all this. Now it’s the system administrators who manage the storage because all those complicated storage management tasks that specialists struggle with are now reduced to a level that we all understand.